What dog moves from one country to the other? What dog changes continents and travels the World? What dog gets a passport and travels by car, train, boat and plane? As you may imagine, not many. However, mine is one of them; and that is what this post is all about: my traveling dog, Enzzo. 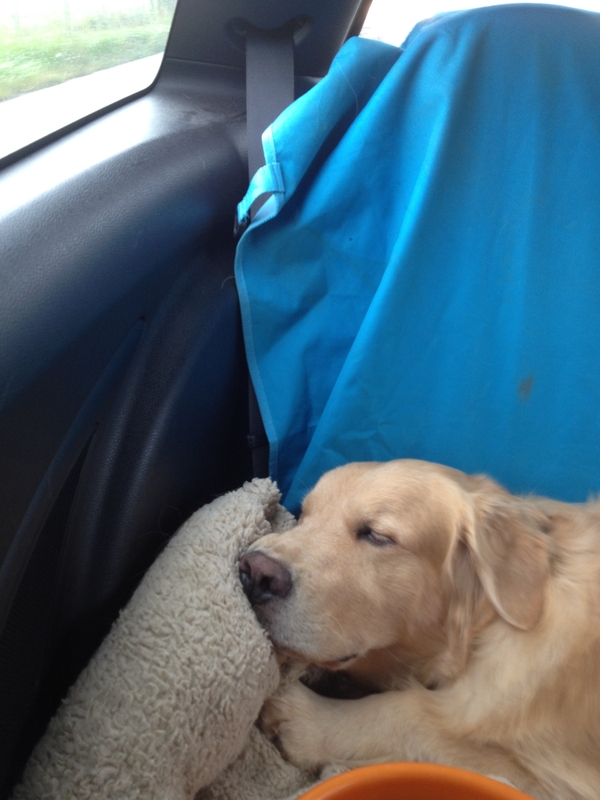 Enzzo is a Golden Retriever, one of my travel companions, to be exact the most special of them. He was born in Brazil – my home country, and where I used to live – and lived there for 4 years of his life enjoying the sun and the beach. This was until I moved to Switzerland in 2011, and brought him along with me. After the long plane journey – his first and only until today – we arrived in Geneva, where we would live together for 1 year, and where he would get his first dog passport! Enzzo was then, a Swiss citizen. Both of us had to learn some rules about the new country, and make some changes in our lives. He would now take the bus and the tram with me, go to restaurants, to the lake, take longer walks, meet new neighbors, wait for me outside the supermarket, and wait for me to clean his little “mess” on the streets. We had an intense year in Switzerland. I learned to be a better dog owner; he learned to be a better dog. We grew up together, faced hard days, funny days, and lived unforgettable moments. We packed suitcases almost every week to visit W in Germany… we drove together back and forth, which resulted in approximately 50,000 Km on the road! And he was always there with me. 1 year later, everything would change again… we were now moving to Germany! W asked me to marry him, and he wanted to be Enzzo’s father. Now we had to move again, learn a new language, new rules, make some new friends, visit new places, change our routine… and get a new passport! Since 2012, Enzzo is a German citizen, though he doesn’t understand the German language much, except for “nein” and “sitz” (No and sit). Throughout these last 3 years my traveling dog also got the chance to travel around Europe with W and me: he swam the turquoise waters of Croatia and the Lake Bled, visited the Ljubljana’s Castle and the Schönbrunn Palace in Vienna, walked through the old streets of San Marino and Verona, traveled by train in Switzerland and by boat in Croatia, watched an amazing sunset and had dinner in a boat-restaurant in Budapest, and played with snow for the first time in Regensburg, Germany. My traveling dog has seen a lot, and still gets excited every time I pack his things for a new road trip. However, he doesn’t appreciate suitcases as I do, along the years he has associated suitcases with me leaving him… so I try to pack as last minute as I can, especially if it’s a trip he is not coming along. List of countries: Brazil, Switzerland, France, Austria, Germany, Croatia, Czech Republic, Hungary, Slovenia, Italy and San Marino. There we go, my traveling dog is officially introduced to all of you! Wow thats a wonderful thing to do, taking Enzzo with you on your adventures. I wish we could take our cats, but cats are so territorial. We miss them so much when we’re travelling and I know they miss us too. Hi Cindy 🙂 yes, whenever we are traveling by car we bring him along. Though, when we travel somewhere that requires flying, then he has to stay 🙁 and we miss him a lot! I can imagine how hard it must be leaving your cats when you travel… and it would be great to bring them too, but I know how cats are, its different 🙁 where do you leave them when you travel? Hello my pretty friend. We leave our babies at home with my brother, but they are so clever when they see us packing our suitcases, they know that we are going away and they want to be carried all the time. It’s very sad. But we buy them lots of treats before we leave and when we get back. Awnnnn how sweet!! I understand how that is… Enzzo gets sad and stressed when he sees us packing 🙁 poor pets, I wish we could always take him along! Thank you!!! They are very sweet, always friendly and great companions… very intelligent too 😀 I hope one day you have one, you won’t regret! 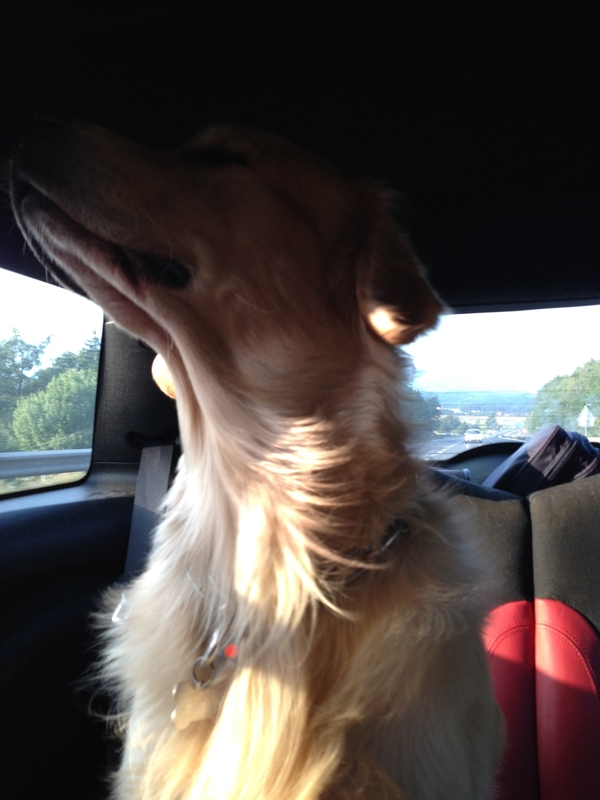 Wow, Enzzo must be one of the best travelled dogs ever – he’s also very gorgeous! Poxa, que história mais linda! Meus olhos encheram d’água! Que vocês possam vivenciar muito mais desse mundão juntos! 😉 O Enzzo é muito lindo! Aii Ana, que fofa!!! Obrigadaaa!! Espero que possamos nos encontrar em breve, assim você o conhece 😀 Fico feliz que gostou da história!! What a happy, beautiful and lucky dog! I know people who have traveled less! hahahaha really?? How cute!! Every dog with its habits 😀 I love it!! Lovely story accompanied by super pictures. Love this post! The photo of Enzzo swimming in Lake Bled is fantastic! What a lucky dog, I am envious…. hahaha can you imagine how cool it would be? I wish I could see the world with his eyes, just to know what he thinks 😀 thank you for the comment! What a lovely account of your travelling dog! Lucky chap. As a matter of curiosity, who looks after Enzzo when he’s not travelling with the both of you? Another point for pondering…what happens to Enzzo if he is not allowed inside restaurants, shops, etc? Here in Europe is very rare to find a restaurant that doesnt allow dogs… in fact, some of them even put a sticker on at the door saying that your pet is welcome 😀 but of course there are exceptions, and when that happens we dont go in, we look for another one…. and when its a store, then one of us stays outside with him while the other looks at the store 😀 Your questions are very interesting, and will be considered for my future posts about traveling with a dog 😀 Thank you!! hahaha and I am very excited to prepare this post 😀 I hope you will like it! I just told my husband about your dog 🙂 I didn’t know you brought him from Brazil! A culture shock to everyone it must have been! Awww what a perfect travelling companion! A very happy pooch for sure! I really hope he is, I try my best to make him happy… he only complains when I leave him alone at home for a couple of hours 😀 then everything is fine again! Love this!! I love that your dog travels with you. And such a beautiful golden retriever too. Thank you dear Joella <3 yes, I always try to bring him alone, I wish it was possible every time, but sometimes staying is for his own good, though I always miss him a lot! Enzzo, is super adorable. You definitely have a bond with your dog! Loved all the photos!! I can’t believe nobody has said ‘it’s a dog’s life!’ 🙂 Well, somebody has now. I think I’d be happy to swap with him but I’m not so cute. I am curious! I was thinking the other way around 😉 But that’s because our friends have dogs and Dante used to his dog walker’s pack and our friends’ dogs then he is familiar with them as part of his pack. Anyway, have a great trip to Egypt! hahaha thats funny, some people love Hurghada, some hate it… what I know is that both are pretty different…. here in Marsa Alam is calm, less crowded, the reefs are very healthy and there are amazing dive sites. I hope you both can give it a try, Im sure you will love it here, there is no way not to be impressed with the diving around here! Thank you dear!! On friday we will go to that famous dive site called Elphinstone, I hope to see some sharks, the last group that went there didnt see any 🙁 fingers crossed! Hope you will see the sharks on Friday 😉 Fingers crossed for you!! This post is adorable. Enzzo is adorable! :)) Once we get back to Europe and/or America we will definitely be taking our baby Ruby with us too! Can’t wait to see that post about doggy hotels. Or dog-friendly hotels? It would sure be helpful. How amazing, Im sure you will be very happy to bring your baby Ruby to Europe!! If you ever need some tips let me know!! Yes…posts about dog hotels and dog-friendly hotels are coming up 😀 I hope you will like them! Awww! cute dog 🙂 and lovely pictures, too! hahahaha ohh noo!! Well, I guess cats prefer staying at home, and dogs prefer being with the masters 😀 so cute! Which dog do you have? Pomeranian Schpitz. He is evil. Adorable. The snow one is my favourite. What a great post! What a beautiful dog you have! Thank you dear 😀 Im happy that you enjoyed it! Yess of course its possible, and Im sure you wouldnt regret it… specially if he is a small one, makes things lots easier and cheaper too 😀 <3 let me know if you need any tips! One of the best blog posts that i have ever read…My cocker Taurus says a woofffff to the travelling dog! How wonderful. It is brilliant that travel restrictions have been reduced and doggie passports introduced. My dog travelled a lot with me but only in the UK. He travelled on trains and ferries but never planes. And it was always hard to leave in when I went abroad! I love the fact you can take Enzzo on so many trips. Oh my gosh, I ADORE this post and the fact that your Enzzo goes everywhere with you! What an absolutely gorgeous boy, too <3 I wish I could take my ginger cats everywhere with me. They're what I miss most when I'm away! hahaha thank you!!! Im happy you liked the post!! When I have to leave him I also feel very sad, and have that feeling that something is missing on my days!! Loving that you have a travelling dog called Enzzo. I too have an adorable Enzo – but with one Z. he’s a two year old cavoodle. We live in Australia but gave him an Italian name due to our love of Italy. A book I’d recommend if you love dogs called Enzo is called “The Art of Racing in the Rain” – an amazing book! Ohhh yes I read this book as soon as Enzzo arrived, such a nice story, I still have it on shelve <3 but I never cried so much reading a book as I did with Marley & me!! Quite possibly, this is the best travel blog post I have ever read! Enzzo is just gorgeous, what a furry little adventurer. I’m sure he makes an excellent travel companion. Brilliant! I’m such a dog lover, the only way I can really enjoy their company is as a house sitter at the moment – I have so many furry friends around the world! One day, when I’m older and a little more settled I’ll definitely get a rescue dog (or two) and we’ll all go a’travelling! Looking forward to more Enzzo-filled posts! Awwwwn that is so cute!!! hahahaha thank you dear 😀 I feel lucky to have him, wh puts a smile on my face everyday 😀 thank you for stopping by! And what an amazing road trip you’ve got planned, I hope you guys will have a wonderful trip together! This year we also have a few road trips planned and we are certainly taking Enzzo along!